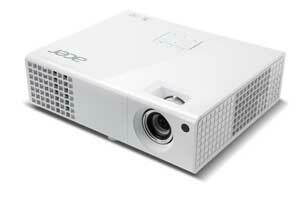 Acer P1173 DLP 3D Projector, Brightness 3000 lumens, 800 x 600 Res, Aspect 4:3. B Grade. These are Open boxed / Returned units that are professionally refurbished.Cosmetically they may bear marks / scratches / small dents, that would not hinder functionality.They may be in replacement packaging might have non-original accessories. Non-essential accessories (Manuals / headphones / cartridges etc) may be missing. Expressive SVGA resolution with 3000 lumens; multiple user-friendly usability; 10000 hours long last life. ColorBoost II+ refines the waveform to improve optical colour performance on lamp spectrum and colour wheel properties. Natural colour temperature is refined to achieve optical colour balance. Colour brightness can be adjusted for different contents or environment. Acer EcoProjection is a complete efficient power management solution that reduces standby power consumption by up to 90%, from 5 W to 0.5 W.
Also featured in the Acer EcoProjection suite is Acer ePower Management for customised power-saving configurations.